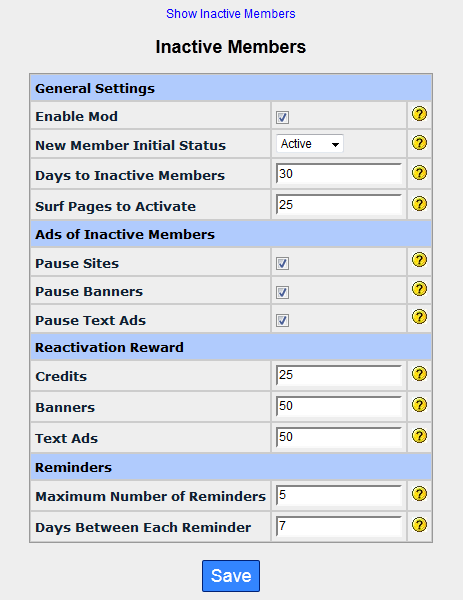 With this mod, free members who have not surfed or read emails in the last N days are automatically marked as Inactive and their ads are paused until they reactivate their account. To reactivate their account, members need to surf a certain number of pages defined by admin and one or multiple scheduled reminders are sent automatically by email to Inactive members. This information is also available in the member area. New members can start by default with Active or Inactive status and you can define a small reward for members who reactivate their account, including credits, banners and text ads. Only free member can be inactivated and your upgraded member will have the benefit of never become Inactive. Email sent to inactive members and information in the member area can be customized with templates and a list of current inactive members is available in the admin area. Admin pages to customize preferences and to show a list of inactive members. Cron job to update status and ads of Inacitve/ Active members. Templates to customize email sent to inactive members and information shown to inactive members in the member area. Installation requires to upload new php files and setup cron job. Temporal access to your cpanel is required for the installation. There is no Impact on LFMTE files. Suspended, unverified or unsubscribed members do not receive reminders by email.